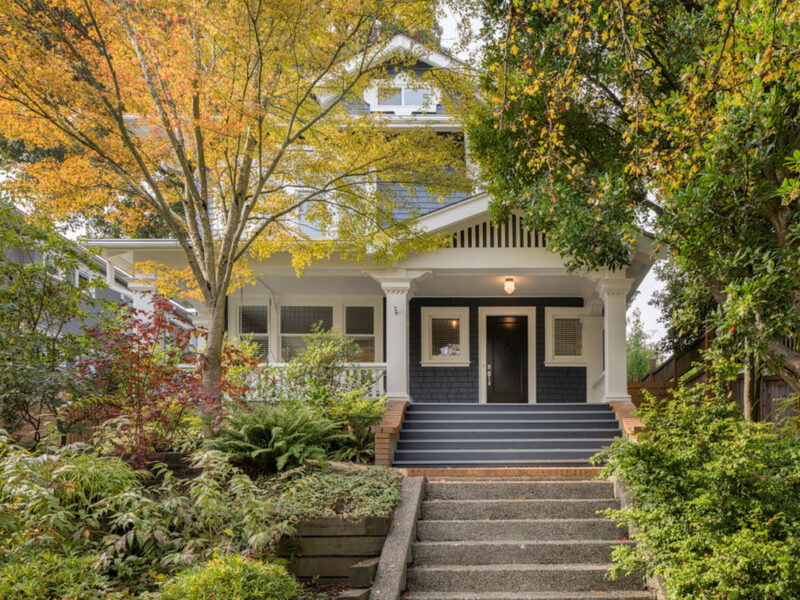 When our clients purchased this gorgeous, old four square home in a leafy central Seattle neighborhood, they knew it would be their “forever” home. It had been remodeled over the years in ways that were now sadly dated, but the bones of the home showing its classic origins were well intact. Our work was cut out for us to uncover and reveal the best parts of the original home, then refresh the home with contemporary styling where appropriate. The design process began with understanding the value of what was existing and worth keeping. It needed a lot of work, and we knew from the start that it was crucial to restore and respect the historic elements of the house. The hardwood floor inlays, beautiful millwork throughout the home, and abundant windows and high ceilings were all very important elements to express. But the owners also wanted to introduce a very modern, clean element into the mix, creating an edgy blend of old and very new. 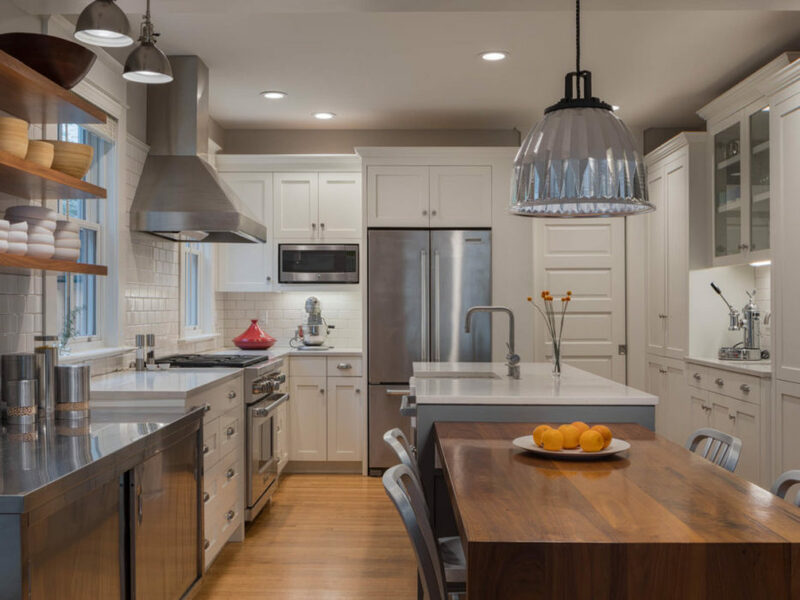 Antique light fixtures and leaded glass in the living areas blend with stainless steel fixtures and contemporary industrial elements in the new kitchen. Our design carved out a larger kitchen/family room that is clean and spare, incorporating some traditional elements such as historic styled trim and subway tile, along with contemporary elements such as floating minimalist shelves and a built-in wood kitchen table attached to the center island. 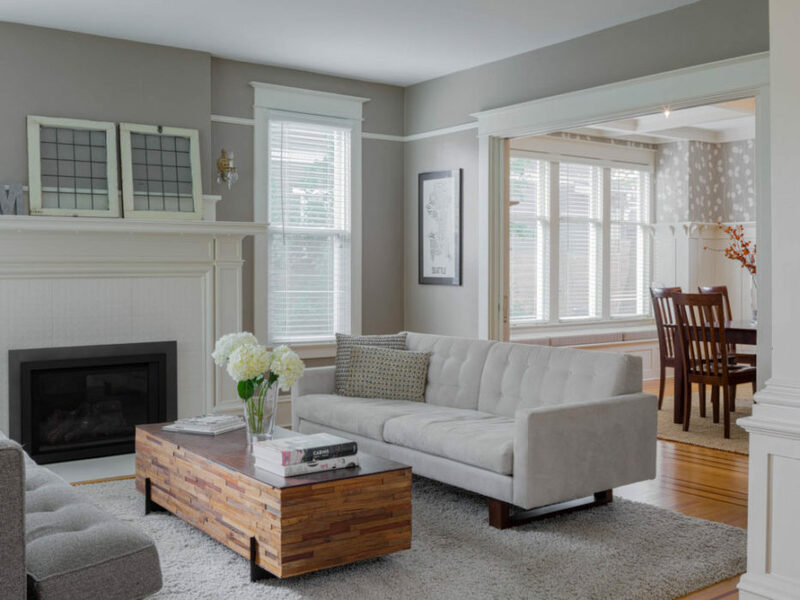 Some rooms, like the traditional Living and Dining rooms, were given a lighter touch: a new fireplace surround with subtle sparkle, or a modern wallpaper with a fun, neutral print. 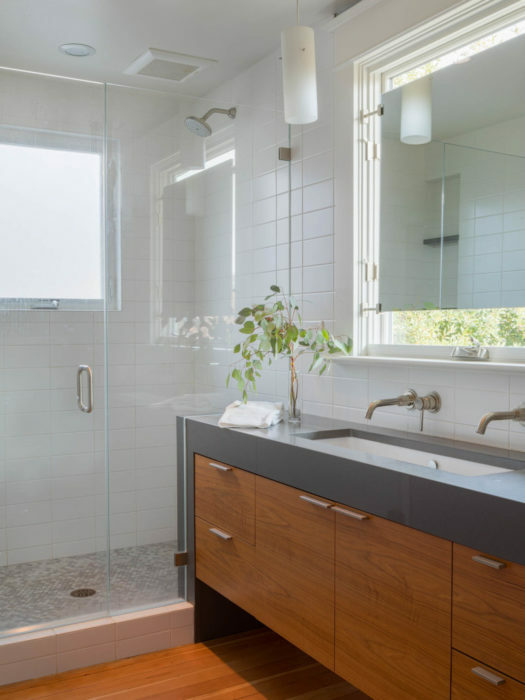 To tie the styles together, a natural palette with warm wood tones was maintained throughout the house, brushed steel finishes were used in both traditional and new elements, and the new shaker cabinetry kept to the style of the original home. 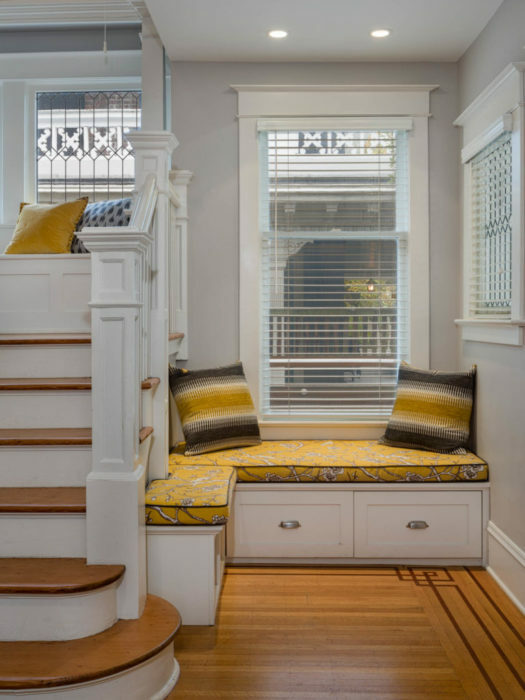 Upstairs, we rearranged a few rooms to create a Master Bedroom suite, featuring custom cabinetry in the master closet for efficient clothing and shoe storage, and a very contemporary but compact bathroom. 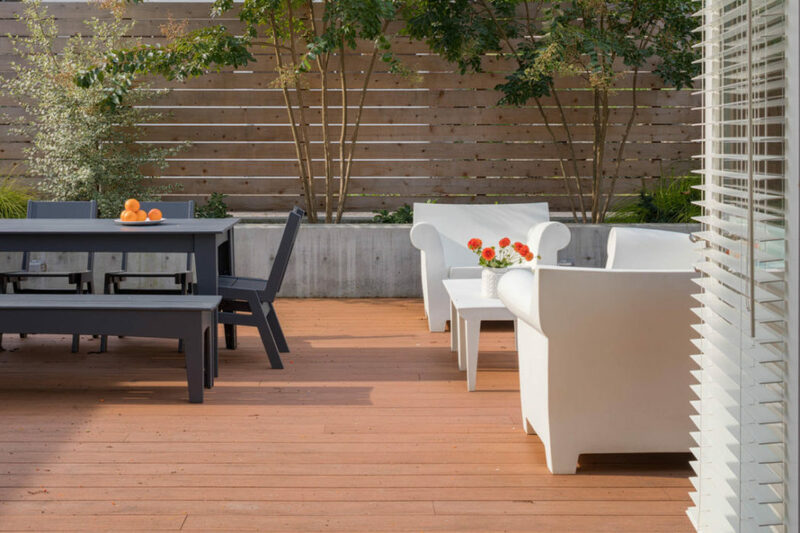 The refresh was not limited to the interior; a new backyard entertaining area is now open and directly off the kitchen and family room. Sequestered by contemporary concrete planters and fencing screens, and featuring a beautiful heritage tree, the clients have a private, outdoor room surrounded by nature. The finished house demonstrates the unique beauty and elegance that can be achieved from the interweaving of history and modernity, and will be a home our clients can enjoy for years!